What would a combined T-Mobile and MetroPCS(s pcs) look like? 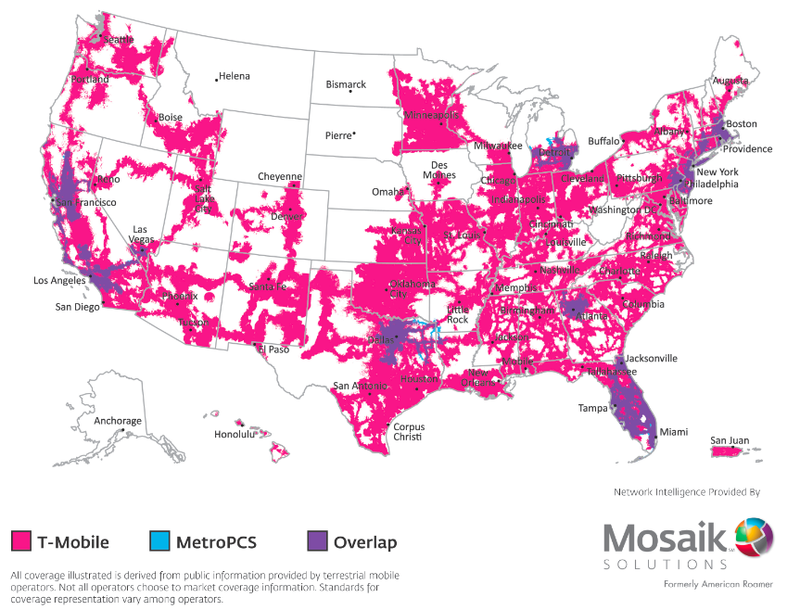 The good people at Moasik Solutions, a network coverage mapper formerly known as American Roamer, have provided us with some handy visuals showing exactly where Metro’s networks and spectrum would add to T-Mobile’s network. As you can see from the first map, MetroPCS owns some big swathes of spectrum, but like most carriers it hasn’t deployed networks throughout its license territory. Instead its focused on the bigger markets and populated regions of its footprint. Pay particular close attention to the darker splotches on the map. 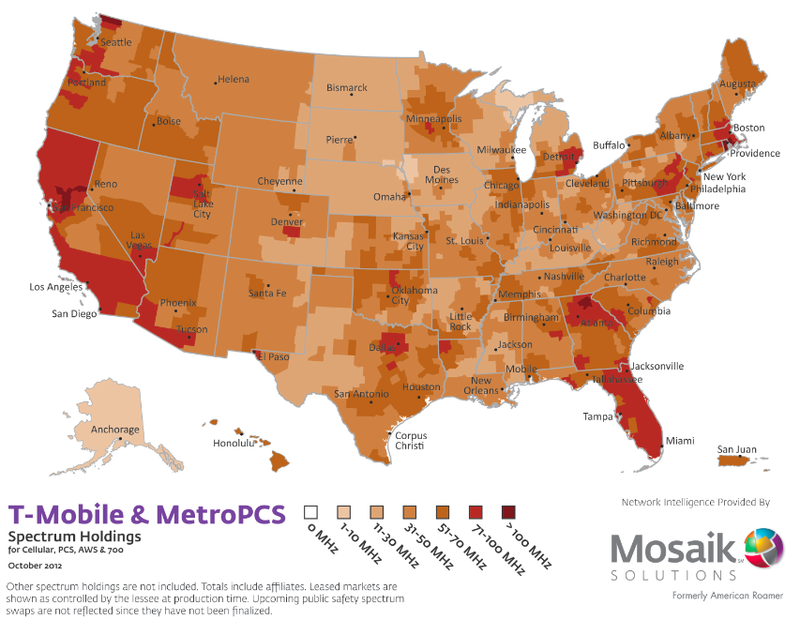 In some regions MetroPCS owns considerable spectral bandwidth – in some cases more than 50 MHz – but for the most part those dense concentrations of airwaves aren’t in big cities. Still T-Mobile is going to get a 20 MHz capacity boost in most of the cities where MetroPCS currently operates. Plus T-Mobile will be able to take advantage of Metro’s unused airwaves outside of the big cities, if it feels the needs. The second Mosaik map shows where the coverage of T-Mobile and MetroPCS actually overlaps. These are live networks as opposed to spectrum holdings so where there’s color you should actually see a signal. In those purple areas, T-Mobile’s network is going to a significant LTE capacity boost. In many areas it will have enough spare PCS airwaves to build out new dual-carrier HSPA+ networks. The third and fourth Mosaik maps should be viewed together. The third shows all of T-Mobile’s current spectrum holdings before MetroPCS is layered on, showing where T-Mo owns frequencies but necessarily where it’s built networks. The last map is the two carriers’ combined spectral holdings, which should give you an idea of the networks they could potential build. Pay attention to the red parts. These are what T-Mobile is really after in the merger. In those red regions it will have more than 70 MHz of overall capacity, which frankly is going to make T-Mobile CTO Neville Ray do backflips. With that much capacity there’s frankly no network AT&T(s t) or Verizon(s vz)(s vod) can build that T-Mobile can’t match. Depending on how quickly the new ‘T-Metro’ moves, it could beat its larger competitors to those cities with a big honking 40 MHz network that puts any 4G network so far deployed to shame. But also note that those red patches only cover a handful of big cities, such as Los Angeles, San Francisco, Dallas, Boston, Detroit, Atlanta and Miami. Even in cities where T-Mo stands to gain substantial frequencies like New York City and Philadelphia, the new merged carrier won’t cross that 70 MHz threshold. MetroPCS is going to give T-Mobile a lot of capacity in some key markets, but its not a spectrum panacea. If T-Mobile follows the old strategy with the old GSM roll-up that created the modern day T-Mobile and acquires US Cellular and Leap Wireless along with some other micro networks, they could theoretically be in the strongest position of all carriers nationally. How’s that for a reversal of fortunes? I doubt the FCC would allow T-Mobile to buy all of those networks. When it’s all said and done, this doesn’t look like a very beneficial merge. The potential is certainly there, but I worry about the weak subscriber base that seems to be growing weaker. Initially, Tmobile stands to regain the count back. However, how many will be lost while the company tries to allocate the resulting goal. It will take several years and with the quick paced advances and characteristics of the wireless industry, this could be an eternity.